It is now November 9 1940. The bitterness of the Battle for Switzerland is something that will live with all Swiss and those German soldiers who participated. Out of the 800,000 Swiss under arms on September 24, 120,000 did not reach the redoubt. Only 15,486 of these soldiers were taken prisoner. In fact, there are more French and Polish prisoners in the German laagers then there are Swiss! The Zytglogge in Bern, Switzerland. Wilhelm Ritter von Leeb, commander of Heeresgruppe C.
Guisan and his staff are secure in the Redoubt, with the Germans unable to penetrate the massive defense works. However, the Germans are rather unwilling to commit so many forces to the strategically irrelevant alpine region. In the areas at higher altitude, the first snow has fallen, tabling any large offensives until the spring of 1941. No less than 20 divisions are in occupied Switzerland, and tensions between occupier and occupied are running extremely high. Just as in Czechoslovakia, all popular gatherings have been banned. Weapons and wireless sets owned by private citizens have been ordered to be turned into authorities, including hunting rifles. Heeresgruppe C has not been redeployed to the eastern front for a Russian offensive, and Wilhelm von Leeb has established his headquarters in occupied Bern for the winter. While the odds were against any sort of meaningful Swiss victory in the event of invasion, such a German offensive was equally unlikely in the early years of the war. By 1943, the possibility of a successful German invasion had dwindled to virtually nothing, as the Swiss Army had expanded and modernized to a point that would make Tannenbaum a suicidal mission. This begs the question: why, then, would Hitler ever have chosen to invade Switzerland? Let us proceed with our counterfactual under the following premises. It is now September 15. The unrestricted bombing campaign authorized by Churchill four months ago has been relatively unsuccessful. Fewer than 25 percent of the bombs dropped are landing within five miles of their intended targets, and only 30 percent have landed in any built-up areas. However, this has had an unintended benefit. Having disguised the few industrial plants manufacturing jewel bearings, the Germans were fairly certain of their security. However, in a truly ironic case, this ended up being more costly, as the plants have been disproportionately hit by the British bombs. Jewel bearings are a main component of bombsights, and without them, Hitler is reluctant to press his luck in the Battle of Britain, much less Operation Sealion. The military picture on the Franco-Swiss border, June 26, 1940. France was defeated. So too were Poland, Norway, Denmark, Holland, and Belgium. Austria and Czechoslovakia had been incorporated into the Greater German Reich. Great Britain stood alone in her ‘splendid isolation,’ and the fascist regime of Francisco Franco held sway over the Iberian Peninsula. In June of 1940, all that remained, surrounded by enemies, was the Swiss Confederation. Hitler called it a “pimple on the face of Europe.” In the heady days of victory for the Third Reich, a move against the alpine republic seemed a great possibility – almost inevitable, even. Even before the Fall of France was made official, plans were being drawn up for ‘Operation Tannenbaum,’ the German invasion of Switzerland. Yet Hitler’s attention was soon drawn towards Britain, and eventually the plan fell by the wayside as he began focusing attention on his Bolshevik neighbor to the East. But…what if? What if Hitler had decided that the conquest of that mountainous pimple was indeed worth the effort and manpower? What if Tannenbaum had been more than just idle words and an OKW plan? If Hitler had embarked on the ultimate folly, the results would have been disastrous for the Swiss – and the Nazis. A consolidated B-24 Liberator of the 15th A.F. 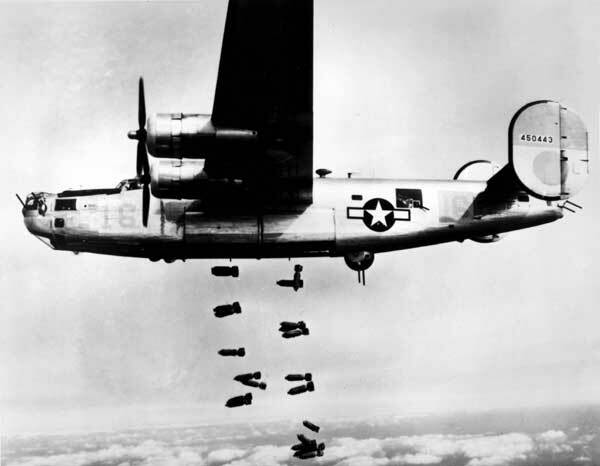 releases its bombs on the railyards at Muhldorf, Germany on 19 March 1945. What if the Allies had bombed Auschwitz? That’s the counterfactual Mark Grimsley poses in his brief, but intriguing piece for World War II magazine (article at BTOSA). As he admits, “most ‘what if’ scenarios begin with a plausible rewrite of a historical event. The bombing of Auschwitz does not have this characteristic.” A strike on the death camps was not seriously discussed at high levels, much less considered a viable option. The Auschwitz complex was well within range of the U.S. Fifteenth Air Force, based at Foggia, Italy … By the summer of 1944, escapees from Birkenau had supplied the Allies with detailed, accurate information about the facility. The crematoria and gas chambers could be readily identified in aerial photographs. Owing to political considerations and the diversion of “considerable air support” that targeting the camps would require, a raid was never launched. Debate has raged for thirty years whether or not it was a moral imperative to attack the camps, but simply put, it was absolutely within Allied strategic air capabilities.